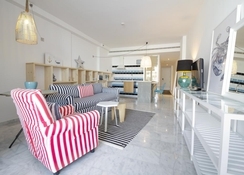 Want to stay somewhere luxurious on your holiday to Gran Canaria? The Marina Suites is celebrated among couples and families for as a plush seaside retreat, located on the scenic Puerto Rico quayside. Equipped with 216 rooms and suites overlooking the Atlantic Ocean, a fabulous infinity pool, a spa, fitness centre, kids’ entertainment and activities, plus delicious cuisine at the on-site restaurant – guests can expect nothing less than 5-star facilities. Marina Suites offers all inclusive packages in addition to full-board and half-board services, to suit every type of guest. 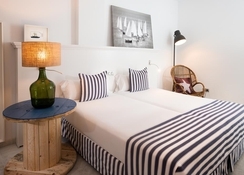 The nautical-themed rooms offer comfort and relaxation complete with modern furnishings and a terrace overlooking the glittering sea. Throw in fantastic hospitality and you’ve got a great hotel fit for families, couples and friends. The Marina Suites is located in Puerto Rico, one of Gran Canaria’s most popular tourist destinations. 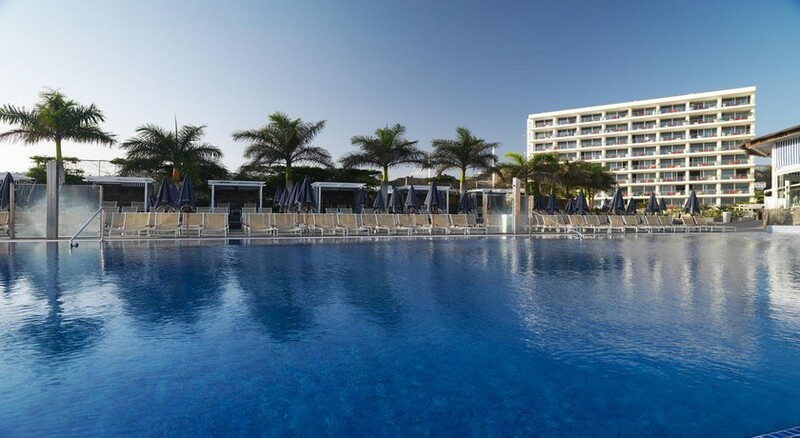 The hotel is centrally located with the beach only 200m away from the hotel (Amadores Beach is 4 km away), shopping areas, restaurants, clubs, bars and a bus stop nearby too. Since the hotel is situated right on the beach and surrounded by a huge garden, the views are pretty spectacular. Puerto Rico is also a great destination for diving, windsurfing, jet skiing, sailing and boat trips. The Gran Canaria Airport is 48.4km from Marina Suites. The hotel is equipped with 216 rooms, divided into six categories: Suite With Terrace, Standard Suite, Suite Select, Premier Suite, Suite Deluxe and Double Suite. 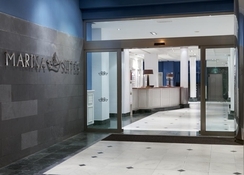 All the nautical-themed rooms have facilities including a safe deposit (chargeable), telephone, en-suite bathroom with shower, work desk, night curtains, hairdryer and TV with satellite connection (DVD on request). In addition to this, the rooms have a fully-functional kitchenette equipped with fridge, dining table for four, coffee/tea maker, plates, kettle, cutlery, two ring hub and toaster. The La Sirena Restaurant in Marina Suites offers breakfast and lunch buffets between 7am to 11am and 1pm and 4pm. The Atlantic Restaurant, another buffet restaurant serves breakfast buffet, and is open till 6pm. Hit the Yacht Club for alcoholic and non-alcoholic beverages, where you can also enjoy magical sunset with live music and live memorable moments with your loved ones. The hotel has a splash-tastic kid’s pool which is heated between 26ºC and 28ºC. For children between ages 4 to 12, there’s a fun kid’s club where kids can engage in various activities such as drawing and colouring, face painting, play dough, flower making, memory games, bowling and numerous theme days. 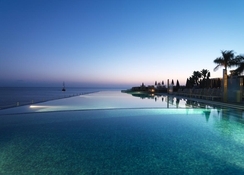 The adult’s pool (heated all-round the year) is built just a few metres above the sea and has a sunset terrace that offers a mesmerizing view of the sea and the surrounding with light refreshment. Adjoining, to the pools are two Jacuzzis that can fit up to eight people. Other than this, there is a fitness centre, recreational room and a luxurious spa for adults. Greeted with bubbly and treats in the room to help us settle in. Lovely staff and a great location for views, restaurants, beaches and bars. We enjoyed the secluded area with the sun beds as it had relaxing music and a hot tub and was generally less busy. Would definitely return if I wanted to visit Gran Canaria's Puerto Rico!